Bar-Bar-A has been successfully watering sheep and goats the easy way for over 25 years. Sheep and goats learn quickly and have ready access to constant fresh water. One unit will water up to 30 head of animals. Whether a small herd or just a lone goat, Bar-Bar- A will work for you. Hot standing water in traditional automatic sheep waterers, tanks, or buckets limits water consumption. Decreased water consumption results in less production and health for your animals. The Bar-Bar-A produces fresh summertime water at a cool temperature. All this because the source water comes from underground water lines and when the sheep or goat finishes drinking the water drains back into the ground, leaving an empty bowl. (See how it works link)This means more water consumption and healthier sheep and goats. In winter, sheep and goats also are challenged with proper hydration because of the icy, frigid standing water exposed to winter air. Because the source water for our units comes from a buried water line, the water is much warmer and easy to drink. In the winter, electrically heated water can be heated so warm that the water is not at comfortable temperature for consumption. The Bar-Bar- A is not limited by these factors. Sheep and Goats Want Fresh Water Too! Desperate for Fresh Clean Water? Keeping your sheep and goats properly hydrated is important. With traditional water tanks and other automatic livestock waterers on the market, water is exposed to heat, cold, and algae; with birds and rodents having free access. In the summertime standing water collects heat from the hot sun and limits water consumption. The same is true in the winter with the winter air turning water to frigid temperatures. 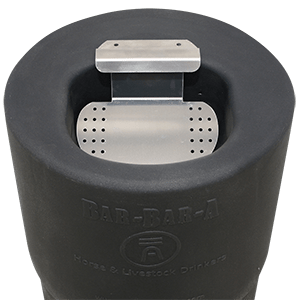 Bar-Bar-A solves the problem of undesirable hot or cold standing water by draining away the remaining water after every drink. The sheep/goat waterer drinker is clean and safe. Palatable water is as important to animals as it is to humans. The majority of sheep and goats learn quickly to use the sheep waterer drinker/goat waterer drinker . For animals needing a little help learning the Bar-Bar-Bar-A sheep waterer drinker can be set for training mode (in the warmer seasons). Once in training mode, the sheep waterer drinker unit will retain water in the bowl. When the process is learned the sheep waterer drinker unit may be reset to drain mode. For wool and meat production proper hydration is a must. Water infiltrates wool fibers making them less brittle and more vibrant. For meat animals, water enhances faster weight gain and better quality meat. Milk producers are also affected for the better with proper hydration. Your sheep or goat’s overall health is connected to proper water intake. In addition, with less time chopping ice or cleaning algae your chore load will be reduced considerably; and without electricity your profit margin will increase. Sheep and goats will drink from 1 to 4 gallons per day from the sheep waterer drinker/goat waterer drinker . The amount consumed will depend upon the size of the animal and the moisture content of the feed consumed. Good water consumption is an indicator of good health. Built To Last for warm or cold climates your animals will notice the difference and so will you. With 4 Models to choose from. Installation automatic waterers– is uncomplicated and personal help is always a phone call away. When the lights go out Bar-Bar-A sheep waterer drinker/goat waterer drinker is still at work.